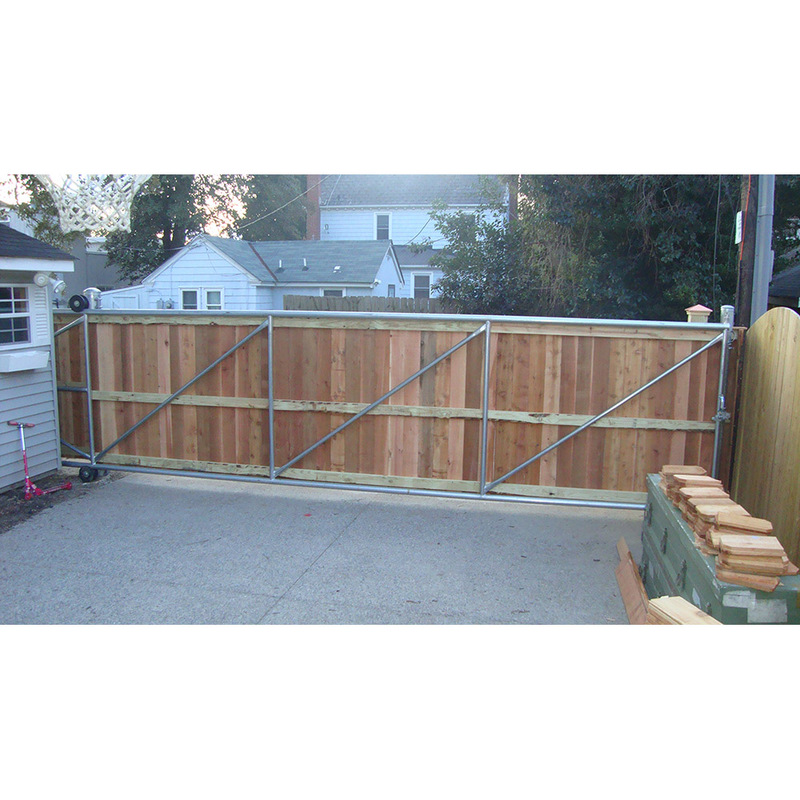 Hoover Fence Chain Link Steel Cantilever Slide Gates | Hoover Fence Co. The term, cantilever slide gate, may refer to any number of gates, from ornamental picket styles to functional chain link styles, from those that require cantilever rollers to those requiring gate tracks and trolleys. All cantilever slide gates will share certain characteristcs which differentiate themselves from other types of slide gates. Steel Cantilever slide gates are unique from other types of slide gates in their construction, hardware choices, and design. Cantilever slide gates are built larger than the gate opening they are designed to close, often as much as 50% larger than their respective openings. The idea here is to hang the gate on two or more mounting posts and have the gate suspend off these mounting posts into the gate opening to close. In general, no part of the gate comes in contact with the ground directly, or indirectly with any type of wheel. Instead, these slide gates 'cantilever' to close the opening. Cantilever construction allows for overhanging structures without external bracing. It is key that cantilever gate frame be constructed properly to help withstand the forces of gravity and wind. Intricate diagonal bracing and trusses are usually strategically welded in place to help prevent gate sag. Advantages to cantilever slide gates over other styles are numerous. Since no part of the gate comes in contact directly or indirectly with the ground, cantilever slide gates are easy to automate with gate operators. Gates can often very easily be installed perfectly level. Proper design, fabrication, and installation of a cantilever slide gate will reduce friction during operation and prolong the life of a gate operator. Gate hardware systems from a quality fence supply source will provide smooth operation and low maintenance. A cantilever slide gate features the ability to slide along the fence line without requiring any lateral space as swing type gates demand. Cantilever gates may use less space than a swing gate system. Single cantilever gates move in one direction, often directly parallel to an existing fence line. This efficient use of space makes a cantilever gate an ideal choice when designing a property's perimeter fence and security system. Cantilever gates may be easier to safeguard than swing gates when automating. Safety devices are strongly recommended, if not required, when automating a gate. Such safety devices may include safety photobeams, safety edges, and loops and loop detectors. 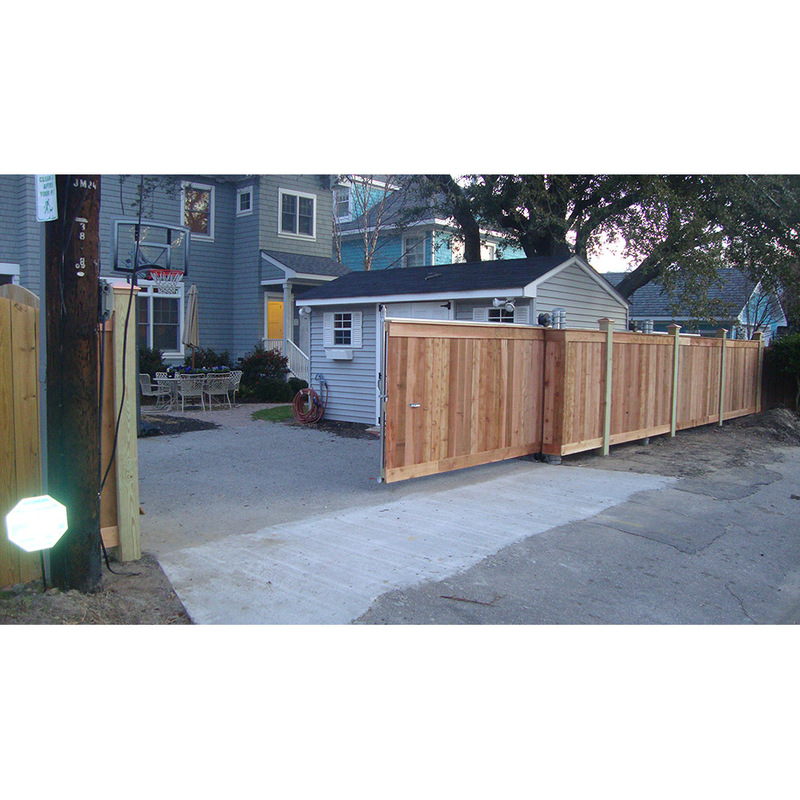 Safety devices are designed and installed to protect against the gate closing on a vehicle. Due to the linear movement of a sliding cantilever gate, the path of the gate is limited in comparison to a swing gate which swings in an arc approximately 90 degrees. Cantilever gates may be less expensive to automate than swing gates. In some instances, when a double swing gate and a single cantilever gate is to be considered, a single cantilever gate will be less expensive to automate since it requires only one gate operator instead of two. Cantilever gates may require less maintenance than swing gates. Cantilever gates may be installed with nylon cantilever rollers with sealed bearings and nylon roller covers. These rollers do not require greasing and the nylon roller itself and cover will not rust. Further, cantilever rollers will install to posts with bolts which are easy to adjust at a later date if necessary. The brackets which typically connect a gate operator to the gate also are usually installed with bolts that will be easy to adjust later. Conversely, swing gates often have hinges which require repeated greasing. These hinges will also often be welded to the gate post and gate making them difficult to adjust if necessary. Lastly, consider snow removal in northern locations. The single path a cantilever gate travels will often be easier to keep clean of obstructions compared with a swing gate and it's wide swing. Cantilever gates are aesthically appealing. The smart appearance, efficient design, and craftsmanship in a cantilever gate is sure to impress owners, visitors, and customers visiting the property. Please specifiy direction of slide upon ordering in the customer comments section. Cantilever gate frames consist of 2-1/2" O.D. horizontal rails, 2" O.D. vertical bracing, and 1-5/8" diagonal bracing; all are welded and galvanized for the longest lasting gate. Chain link is 9ga. 2" mesh (1.2 oz. zinc galvanized after weaving). Gates are fully stretched, including counterbalance so they do not require modification if you wish to automate in the future. The slide gate counterbalance should be approximately 1/2 the length of the gate opening. Minimum counter balance should be 4' long. If an automatic operator is to be installed, the counter balance may need to be longer so the operator can 'pull' the gate shut by the rear of the counter balance. Post sizes are important. Generally steel chain link cantilever slide gates require 3" O.D. roller posts for widths up to 10' opening size. Use 4" O.D. posts up to 20' and 6-5/8" O.D. posts up to 32'. These specifications are for 6' high gates and shorter. 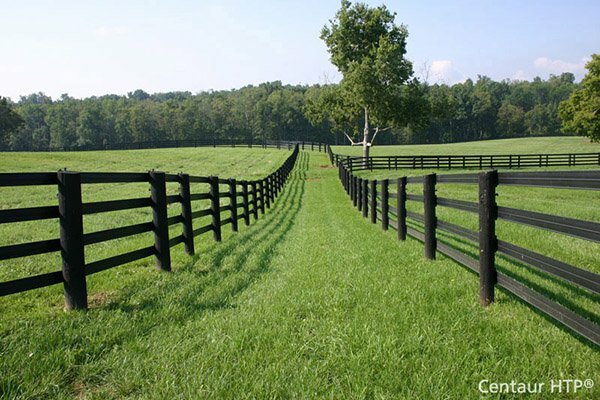 For taller gates increase post sizes at each step and use 8-5/8" O.D. posts for 32' gates. We use mostly 4" OD steel posts for our aluminum slide gates. Concrete footers need to be significant. 18" diameter x 42" deep is recommended for 3-4" posts, 24" diameter x 42" for 6-5/8" O.D. posts and 30" diameter x 48" for 8-5/8" O.D. posts. Increase bottom diameters 6"; creating a bell-shaped hole. The up and down stress with these type gates will 'work' even the largest posts out of the ground. Poor soil conditions, such as sand, will require larger footers. Always consult local building codes or practices prior to beginning any construction project. Call 811 prior to excavating post hole footers. How much does it cost to have vinyl coated chain link fabric stretched on a gate? We do not charge anymore if you'd like a gate stretched with vinyl coated chain link; simply specify color when ordering. The framework will remain galvanized. Cantilever gate rollers 'sandwich' the gate frame, any painted framework would be scratched off on the top and bottom horizontal pieces. We do not weld cantilever frames vinyl coated or powder coated. Is there a leading edge rolling wheel on the latch side of the gate? No, a leading edge roller is not necessary. What is the maximum width of a steel cantilever slide gate? The maximum width on a cantilever is a 32' opening size. They can be doubled to make a 64' opening with two gates. We also offer single, double, and box framed aluminum slide gates which can enclose openings of up to 120' wide with two box framed aluminum cantilevers. Do I need an operator on this gate or how difficult is it to open manually? You do not need an operator. Larger gates, say 20' opening gates, are naturally heavier and more difficult to open than smaller gates. We offer kits that are both manual and automated so we have you covered either way! Can these gates be used with vinyl or wood fence? Yes, however the top and bottom rails of the gate can not be obstructed. The galvanized tubular top and bottom rail would be exposed so it is a matter of if how it would look. There isn't much point in painting these rails as it would rub off because of the rollers. The prices would not change even though we would not ship the gate with chain link. 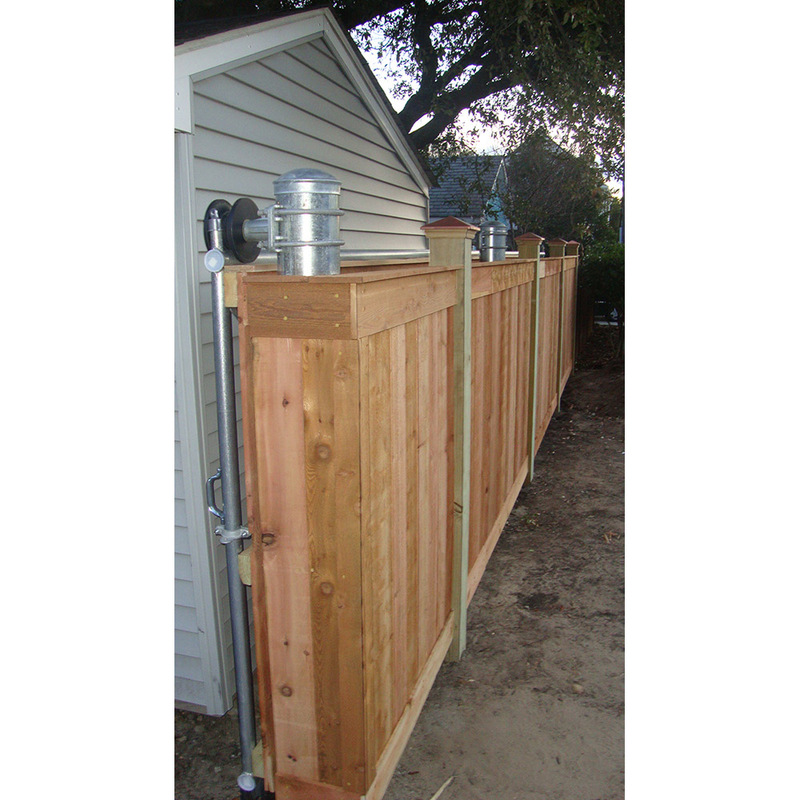 To attach wood to a cantilever gate, you may mount wooden 2 x 4s to the gate verticals and mount your pickets to the 2 x 4. This not only makes it easier to mount the pickets since you can now do so with regular nail, but it will also offset the fence and not obstruct the cantilever rollers. The frame could be hidden completely behind the wood or vinyl fence. Use caution when trying to do this as there will be a large windload on all of the components once you sheet the gate in wood or vinyl. You will also be increasing the weight by 50%, possibly even doubling it. For this reason, you will likely need larger posts, and maybe even another set of roller posts. Hoover Fence is not responsible for this type of installation as our gates are not designed with this application in mind. Can barbwire be added to these gates? Yes, we would weld on special barbarms to the gate in such a way to not obstruct the rollers. There is no barbwire on the counterbalance as it will slide behind the fence line. We also carry bolt-on barbarms that can easily be added to any existing cantilever gates. These are "L" shaped to prevent obstructing the rollers. How are these gates shipped? All cantilever gates ship common carrier. In some cases we ship the gate in two pieces usually to be bolted together with plates; occasionally it is best to weld and grind the seams of the two pieces. Generally, posts are set one day and allowed to cure in concrete. 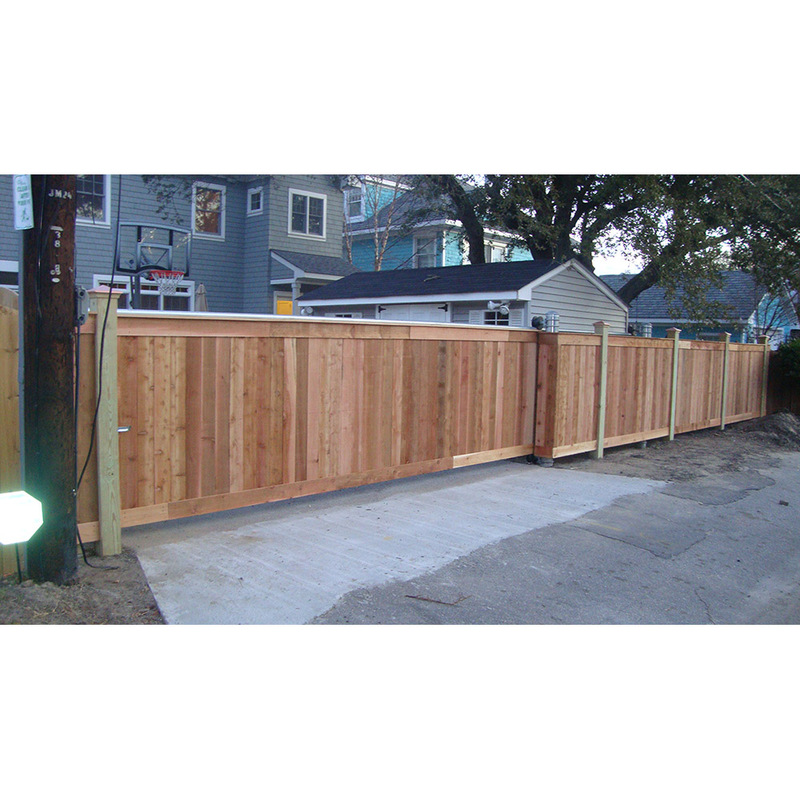 Gates typically deliver fully assembled and simply need hung from trucks or rollers. 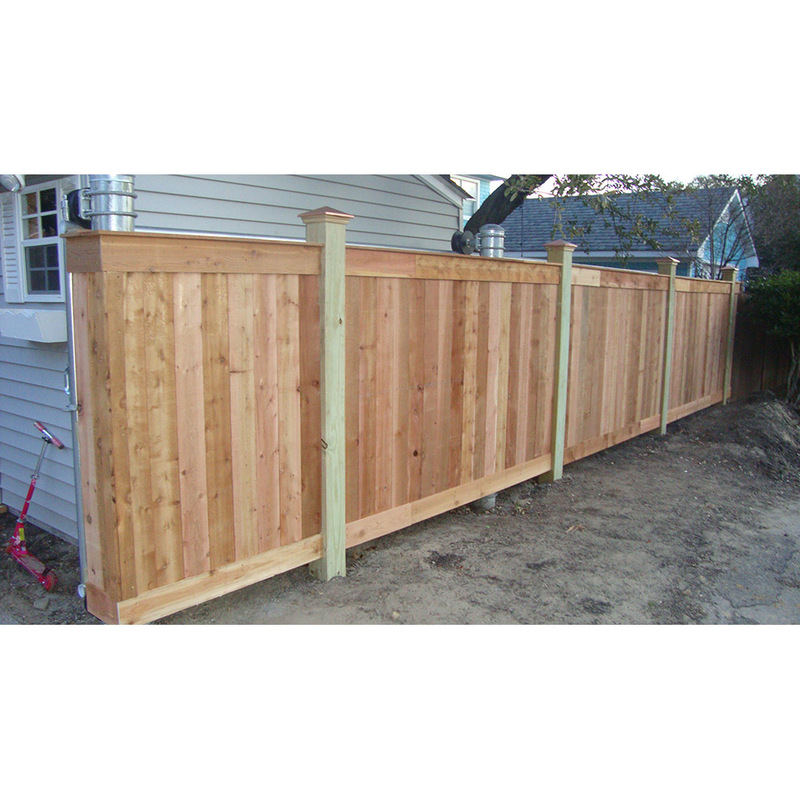 Installing posts and truck brackets plumb and level assures smooth gate operation. Exceptionally large gates may need shipped in more than one piece and assembly finished in the field. Two piece gates will be 'sleeved' for ease of assembly in the field.